Sprouts has this once a year superb avocado sale I wait for every year….3/$1! And for once it’s not the puny ones with huge seeds! The 99 only store does have that bag of avocados for $1 but they’re the tiniest avocados I’ve ever seen and most of them were already very ripe. And yes, I know it’s weirdly strange for a person to get so excited about avocados on sale, but I can’t help it…I LOVE avocados. My future plans with my 12 avocados are for sandwiches, salads, guacamole, avocado smoothies, avocado ice cream and anything else I could think of! Recipes to come! I woke up this morning knowing I needed a good breakfast to get me through 4 hrs of straight lecture. I had just bought the avocados yesterday, so I wanted avocados with eggs. 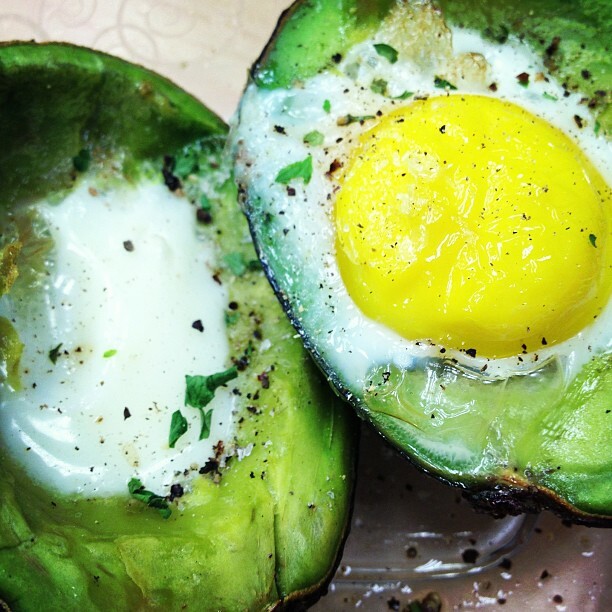 I was on a time crunch (like every morning), so I quickly just cut open and avocado, scooped out the some of the avocado for lunch later, cracked an egg and threw it into the oven. It baked while I was getting ready, and by the time I was about to leave it was already done! It makes it very creamy, warm and buttery. You can top it off with whatever you like (bacon, green onion, cheese, ect) but I just quickly threw on pepper, salt and parsley. Who says you can’t have a quick to make delicious breakfast? 1. Cut your avocado in half and remove the pit. 2. Scoop out about 1.5-2 Tbsp of each side of the avocado. You want enough room for the egg. Place avocado on baking sheet. * Save the avocado for salads and sandwiches. 3. Crack and egg and put the yolk and as much of the white that can fit in one half (the bigger half if you have a bigger side) and the rest of the white in the other half. 4. Bake avocados for 25 minutes. 5. Top with anything you like! I like fresh ground pepper, salt and dried parsley on mine. **Note: the trickiest part of this is getting the egg-filled avocado to the oven without spilling. Mine kept rolling around on the pan so I opted to just stick my hands into the oven (very unsafely) and made sure they stood up. Once you get them into the oven standing up it’s no problem though! I think using a 6 cup muffin pan would probably work best to balance the avocados. If yours spills over, just pour it back into the avocado and try again. My days are usually pretty packed – especially in the mornings. That’s why I like to a good breakfast in the morning. Like many people, I’m usually in a rush to get out the door too, so here’s a very quick recipe to jump start a healthy morning and give you the energy you need for the day (or at least to get you there until lunch)! I like to buy a tub of greek yogurt at Costco ($4 for a huge tub!) – it lets you control the amount of sugar in your yogurt versus getting the individual serving cups. Greek yogurt is good not only to eat by itself, but it can be used for baking or made into salad dressings. 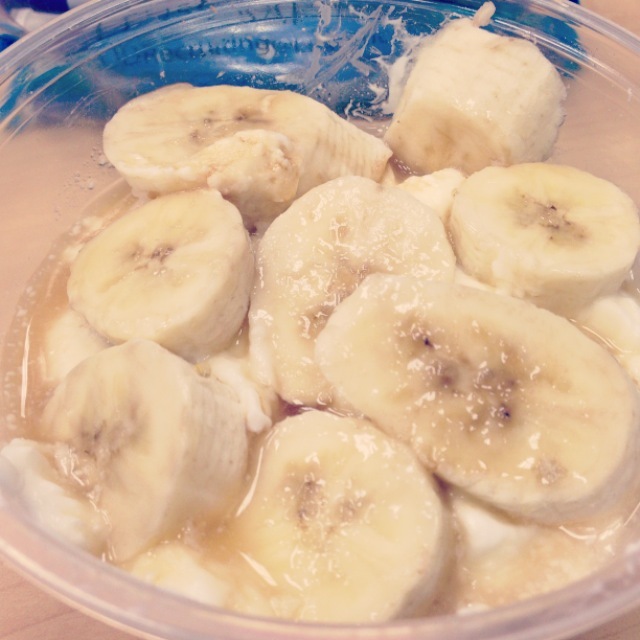 Quick, healthy and yummy breakfast with items you probably already have in your kitchen! Scoop yogurt into a bowl. Top it with fresh sliced banana and drizzle everything with honey and a dash of vanilla. Top with optional raisins and granola. Eat it there or take it on the go! Mix it up and enjoy! My kitchen is back thank god! It had be NIS since Friday, total of 5 days. That’s 5 days of eating out for breakfast, lunch, dinner and it was been killing me! I couldn’t be happier to have a kitchen again. I’ll probably have to do a juice cleanse from all the Chick fil-a and Chipotle I ate. Since my kitchen was MIA for a few days, all my Costco bananas became super ripe. I stored them in the freezer for future smoothies, but I left 3 bananas to make, what else? Banana bread! 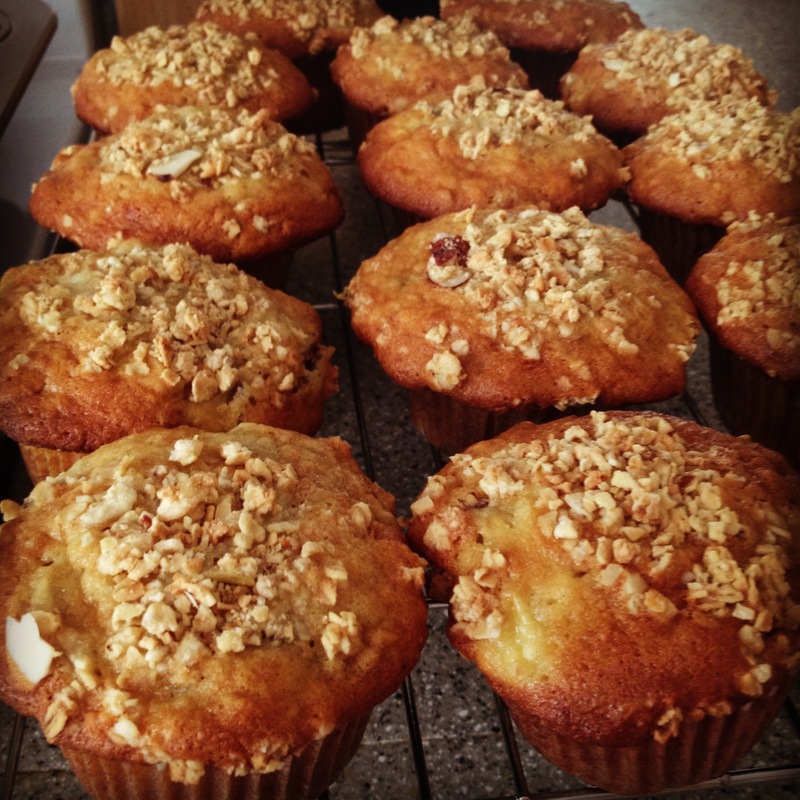 Banana muffins, actually. I love this recipe because it’s really easy and I often have the ingredients in my kitchen already. This recipe gives banana bread a crunchy twist that everyone that I’ve baked for raves about. I always have granola on hand because Sprouts has a different granola on sale each week in their bins, and they’re just so good on top of yogurt! Muffins are just so much easier to serve when I’m in clinic (don’t want to bring a knife into a clinic). Enjoy! 1. Sift together flour, sugar, baking powder, baking soda and salt. 2. With your mixer on the lowest speed, blend together the flour mixture and melted butter. Note: flour tends to puff everywhere so I recommend mixing in the sink. Also, mix in the butter with a spatula first before the mixer. 3. Add in eggs one at a time, milk, vanilla, and mashed bananas. Scrape the bowl and blend well. Don’t overmix! 4. Fold in your diced bananas, 1 cup granola, and 1 cup diced walnuts. 5. Line the muffin pan with paper liners and spray with non-stick spray. 6. Spoon the batter into each paper liner, filling to the top of the cup. Top each cup with granola. 6. Bake for 25 minutes, or until tops are brown and toothpick comes out clean. Let it sit in the pan for a few minutes to cool, and serve. Still on my week off of break so I’ve had a lot of time to experiment. The last two days I’ve attempted to make croissants from Julia Child’s recipe, and let me tell you I do not wish that kind of horror on anyone. Slightly hyperbolic, but not too far from it. It was extremely time consuming and a lot of muscle and sweat put into rolling out the dough and folding it many times to get all those 86 layers of buttery flakiness a croissant has. My inspiration was to try to make my own cronut (half croissant, half donut, all delicious). 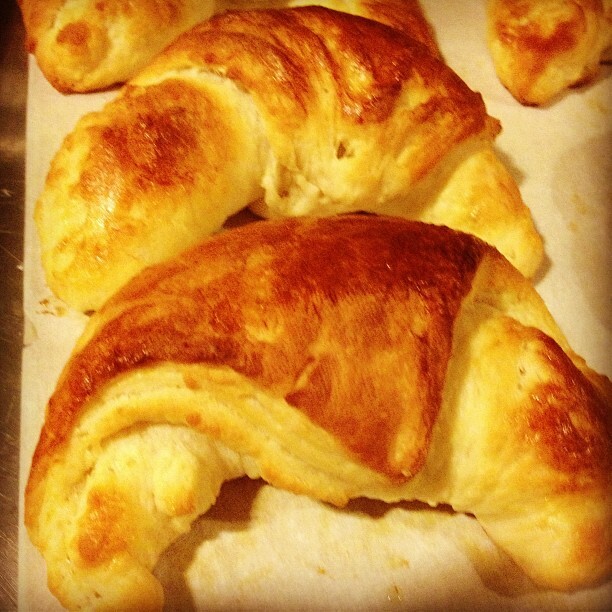 But, if you ever want warm, homemade croissant, Trader Joe’s croissants are THE best way to go. They are the perfect “homemade” croissants you can get. They’ve got buttery and flakiness down to a par and all you have to do is let is sit overnight then bake for 20 min the next day! You’ll never buy those old Costco croissants every again! Surprisingly, Julia Child’s recipe came out to be more like Viennese croissants rather than French, which is slightly more bread-ier than the French version, but still delicious! A bit of history: croissants actually originated from Vienna and brought to Paris and popularized by Marie Antoinette. 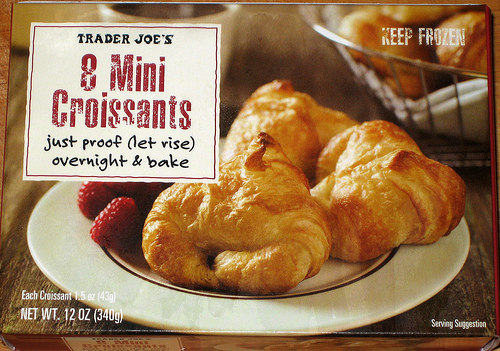 To be honest, I’m pretty sure even Marie Antoinette would enjoy some fresh baked Trader Joe’s croissants! They’re that good!! And no, I’m not a spokesperon for Trader Joe’s. Below is the recipe just in case you are brave enough (and have enough time) to try it. Good luck! 2 cups of flour – both Julia Childs and I agree her flour mixture comes out much nice: 2 parts pastry flour, 1 part all purpose. It has a lower gluten content in it which will make rolling out dough MUCH easier and less likely to spring back on you. 1. Mix the first 4 ingredients together (yeast, 1/4 tsp salt, 1/2 tbsp sugar, 1/4 cup warm water). Allow the yeast to start bubbling which tells you the yeast is active. 2. Mix together your the flour, sugar and salt. Incorporate your milk, oil and yeast mixture. 3. Knead your dough. I used a kitchen aid dough hook for about 5 minutes. If you’re using your hands, you can use Julia Child’s slap down method, which includes a lot more fun (and work). 4. Let the dough sit in a bowl and snip a small “X” on top of the dough with scissors. 5. Cover the bowl with a bowl and let it rise for 1hr-1 1/2 hr at room temperature. 6. When your dough has doubled in size, punch down your dough, cover it with plastic wrap and chill for 20-30 minutes in the fridge. 7. Time to soften your butter! Take out your chilled butter and whack it down with your rolling pin until it is flat and not lumpy. You can use the palm of your hand to work out the lumps. You want the butter to have the same consistency as your dough. You need to work FAST so the butter does not get warm. 8. Flatten your dough to a disc larger than your butter. Place your butter in the center and fold the dough into the center and pinch it to make your “dough package”. You don’t want pieces of butter sticking out! 9. Flour your board very lightly. Roll out your dough package into a rectangle about 14″ inches long, and about 6-7″ wide. 10. Fold it into 3 by folding the top third in, then folding the bottom third over it like a business envelope. 11. Turn the dough envelope so the folds face you and roll it out again to your same rectangle. Repeat step 10. 12. By this time, your dough will be too warm to work with, so you want to chill it again in the fridge for 1-2 hours. 14. After 2 hours, take your croissant dough on a lightly floured board. Roll out a rectangle this time about 20″ long and 5″ wide. Cut this piece in half and chill 1 half. 15. Take the other half and roll it out to a rectangle about 12″ long and 5″ wide. 16. Cut this piece into 3 sections and chill 2 sections. 17. Take your one square section and cut it corner to corner so you make 2 triangles. An isosceles triangle is ideal where 2 sides are equal. 18. Start from the bottom of the triangle and start rolling towards the point. Pull the 2 sides of the croissants in. Make sure the point of the triangle is tucked well to the bottom of the croissant and set aside on a baking sheet. You will have 2 croissants made at this point. Do not be distressed if your croissants don’t turn out as beautiful as you normally see them….it takes practice and precision to roll out the dough right! They will still taste yummy! 19. Take your other 2 sections and repeat step 17-18 to make 4 more croissants. 20. Take your other half and repeat steps steps 15-18 to have a total of 12 croissants. 21. Let the croissants rest for 1 hour at room temperature. They will puff a little bit at this time. 22. Preheat your oven to 475 degrees. Make an egg wash of 1 egg + 1 tbsp water, beating it. Brush this over the top of your croissants. This will give it a beautiful glazed appearance. 23. Bake your croissants for 10 minutes or until golden brown. 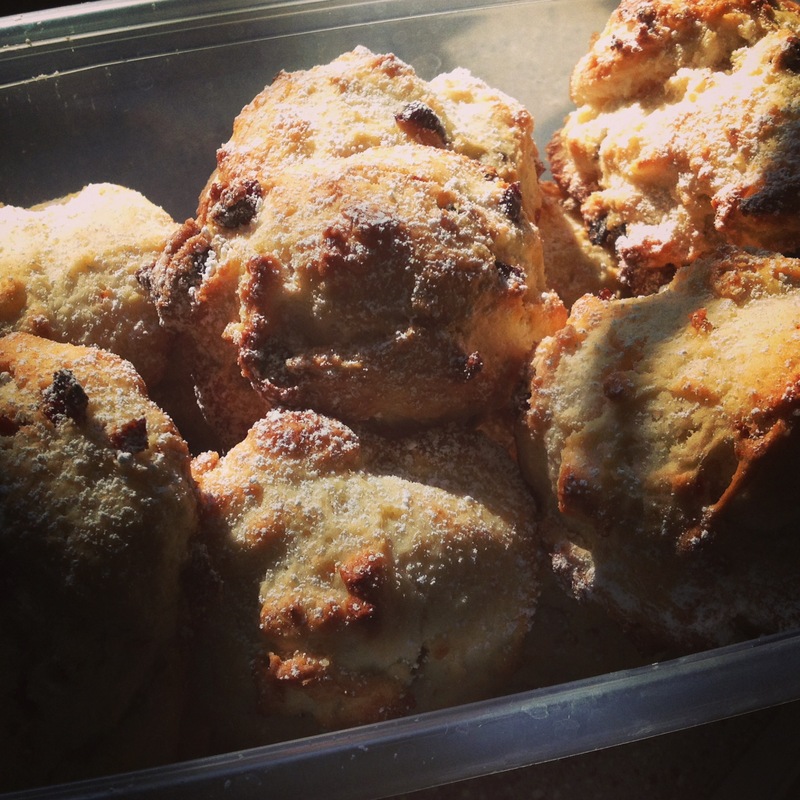 They will puff up even more and fill your house with yummy smells. Let them cool on a rack for 5-10 minutes. And voila! as Julia Childs like to say. Bon appetite!